In the actual distribution, the top fifth holds over 80 percent of all wealth. The average estimate of the holdings of the top fifth, however, was substantially lower: just under 60 percent. Even so, the average American thought that 60 percent of the wealth was too much for those at the top. 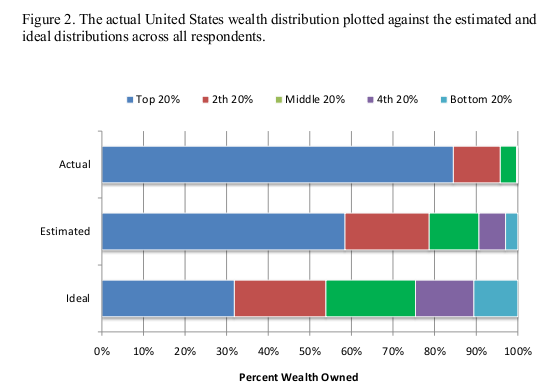 The ideal allocation had the top fifth holding only a bit over 30 percent of all wealth. Even those respondents who voted for George W. Bush (a separate graph, not shown) look like they’re far to the left of “actually existing capitalism.” On average, Bush voters estimated that the wealth share of the top fifth was close to, but not quite 60 percent. But, in an ideal world, Bush voters thought that the top fifth should only have about 35 percent of all wealth (for Kerry voters, it was about 30 percent). UPDATE: 09/28/10. Economist Dan Ariely has a very good blog.